Volume Scaffolded Notes 2 Cryptogram Worksheets Blank Shape sheets for Triangular Prisms, Rectangular Prisms, and Cylinders Plus Keys for everything This is a great follow up to any discovery lesson on volume. This activity is 3 pages and includes a basic practice page, a real-life application page, and a page of answers. 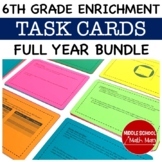 Also included in: Volume Google Form Bundle – Perfect for Google Classroom! 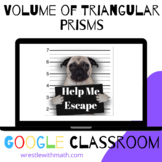 Volume of Triangular Prisms – Bad Dog Breakout for Google Classroom! Also included in: Volume – Bad Dog Breakout Bundle for Google Classroom! 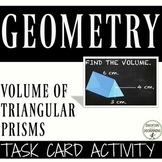 In this activity, students will find the volume of triangular prisms and pyramids. Students line up "domino pieces" with a problem and a correct answer to form a train that ends where it begins. Also includes an answer document where students can show their work and keep track of the "domino train. This worksheet is design to help students practice the sills required calculate Volume – Triangular Prism. 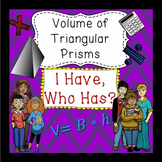 Use these 6 questions to help students learn how to calculate the volume of triangular prisms. Some of the answers have repeating decimals. Answer key included, and the step by step process is included as well. 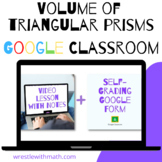 Volume of Triangular Prisms Worksheet with Key! 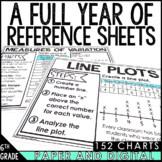 This worksheet helps students find the volume of a triangular prism. It helps guide them to the correct answer by breaking down each of the steps in order to successfully use the formula V = Bh. Answer key is included. 1. Explain. What does the formula state? Remember to use the correct terminology. 2. Find a right prism in school or home and measure. Remember to document your calculations using a picture, diagram, video etc. 3. Application: connect the volume of a right prism to a real life scenario.